Does the Garden spider / Cross spider bite? The common Garden spider (Araneus diadematus) is a common sight in gardens throughout Britain at the end of summer where it is seen suspended, head-down in the centre of its orb web. Also known as the Cross Spider it can be identified by the cross-shaped pattern of white spots on its abdomen. Colour varies considerable from pale yellow-orange through to dark grey and the legs are banded dark and light giving a striped appearance. This is one of the UK’s largest spiders with the female’s body reaching 20mm in length. The male is much smaller which is unfortunate as he will occasionally get eaten after mating if he doesn’t make a quick enough retreat. Every evening this species of orb spider eats its web (and any small insects stuck to it) spinning a new web in the morning. 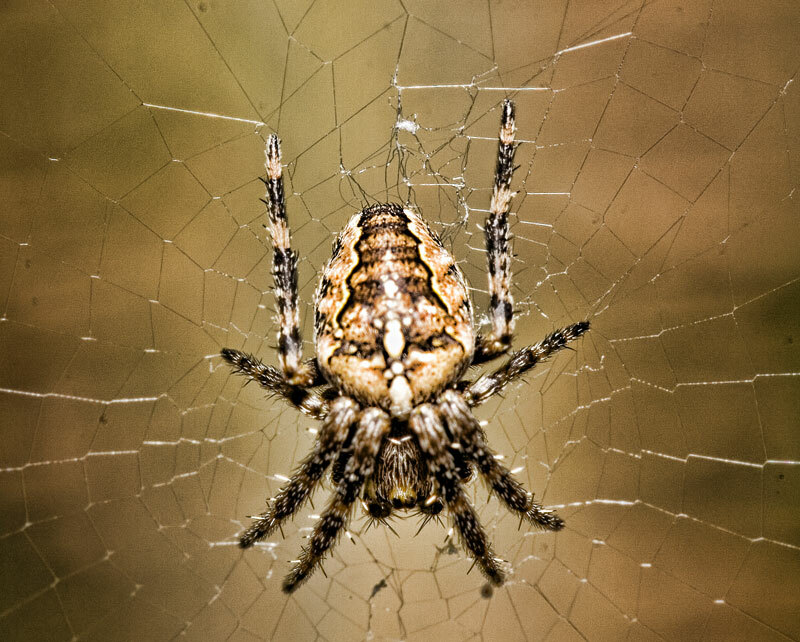 If disturbed in its web by potential predators the garden spider can cause itself to oscillate violently. Araneus diadematus has been reported to bite on rare occasions but it is apparently difficult to provoke a bite. The spider’s bite is mild although some swelling and pain was mentioned in one case. Whether this was due to the action of the venom or an allergic response is unclear.